GatorCPR | GatorCNA and Beeline Medical Training are proud to be your CPR and CNA provide for Gainesville FL, Ocala FL and surrounding communities. We provide American Heart Association (AHA) and American Safety & Health Institute (ASHI) certifications at our Gainesville and Ocala locations. Our professional instructor team can travel anywhere to accommodate your training needs. We offer CPR/AED, First Aid, BLS, ACLS and PALS. GatorCNA and Beeline Medical Training offer CNA Prep Classes. We prepare each of our students to pass the State of Florida' Board of Nursing State Exam for Nursing Assistants. In Feburary 2018, American Heart Association released its new BLS Renewal Course. This course is only for those that hold a current (non-expired) BLS certification from AHA. This is an option for those that can not find a BLS Renewal Course that fits their schedule. At the end of this class (same day), each student will receive a Certification Card from the American Heart Association (valid for a full 2-year period). $6 DISCOUNT for Students (must have valid ID). Enter STUDENTBLS in the Promo Code box during registration to receive your discount. Course Materials: GatorCPR provides the 2015 BLS Student Manual for each student to use during the class. If you want the 2015 BLS Student Manual for yourself, Click Here to purchase your own eBook. For questions about eBooks visit: http://ebooks.heart.org/faqs. BLS is the foundation for saving lives after cardiac arrest. The AHA’s BLS Course has been updated to reflect new science in the 2015 American Heart Association Guidelines Update for CPR and Emergency Cardiovascular Care (2015 AHA Guidelines for CPR and ECC). This course teaches both single-rescuer and team basic life support skills for application in both in-facility and prehospital settings. HeartCode BLS is the AHA’s blended learning delivery method for the BLS Course. Blended learning is a combination of eLearning (online portion), in which a student completes part of the course in a self-directed manner, followed by a hands-on session. HeartCode BLS is the online portion of BLS blended learning. It uses a variety of eLearning assets such as dramatizations, eSimulations, animations, self-directed learning, and interactive activities to teach students BLS knowledge and skills. After completing the online portion, students will attend a structured Instructor-led course that focuses on meaningful skills practice, debriefing, team scenarios, discussions of local protocols and skills testing. Course Length: 4.5 hours (Online Module - 2 hours PLUS 2.5 hours for Classroom). NOTE: This is a BLS RENEWAL COURSE for those that have taken a BLS course within the last 24 months. You must show a current, valid (non-expired) American Heart Association BLS card at time of check in. If your BLS certification has expired you will need to take an AHA BLS Intital Course or BLS Heartcode Blended Course (Part Online Module with Classroom Portion). PALS Classroom - GatorCPR DOES NOT offer PALS Classroom at this time. PLEASE READ: All students must take the FULL COURSE to receive the 2015 AHA ACLS Certification. There is a renewal option, but you must first show proof you have taken the ACLS FULL COURSE with the 2015 AHA Guidelines. Course Requirements: You must hold a current BLS certification. You must also complete the Pre-Course Work (see below). Course Materials: All students are required to have a current AHA ACLS Provider student manual (workbook) during the class day. IF a student arrives at class without a student manual (workbook), they will be required to purchase one for the course or will be rescheduled to a later course. The ACLS Provider Manual is REQUIRED. You can purchase your own here or borrow one from a friend, workplace, etc. Students are highly encouraged to review the entire ACLS Provider Manual before class. Complete the Pre-Course Self Assessment. You need a passing grade or 75%. This may require you to take this pre-course assessment several times. American Heart Association Update: As of January 1, 2018 the AHA has transitioned from physical cards to an electronic card (eCard) system. An eCard is sent to you the same day of your training and consists of two (2) PDFs, a valid training certificate and printable wallet card that can be presented to an employer, school or credentialing agency as proof that you have successfully completed training. GatorCPR and AHA 100% stand behind the validity of these eCards and can 100% assure you that eCards will be accepted. The following link below is how you, as a student, can access your certification and how your employer can verify your certification: www.heart.org/cpr/mycards. Thank you! NOTE: This course is an ACLS Renewal. You must hold a CURRENT American Heart Association ACLS certification. If you have an expired AHA ACLS card or you are taking this for the first time, you need to take the ACLS Initial Course. Course Requirements: You must hold a current ACLS. You must also complete the Pre-Course Work (see below). Complete the Pre-Course Self Assessment with a passing grade of 90% and bring your pre-test with you to the training. Each student will receive an ACLS Certification Card from the American Heart Association (valid for a full 2-year period). Advanced Cardiopulmonary Life Support (ACLS) Online Renewal Certification is a three part process. Completion of the full course includes Part 1 online, plus an in-person skills practice and testing session (Parts 2 and 3) with a GatorCPR AHA Instructor. Course Requirements: You must hold a current BLS certification. Step 1: Complete your registration. Step 2: Take Online Modules. Follow instructions in confirmation email (check your spam folder). Step 3: Print your online certification of completion. Print and bring this certificate with you or email your certificate to cpr@gatorcpr.com. Step 4: Attend your skills demonstration and skill test. With your online course complete and completion certificate in hand, attend your scheduled course with one of our AHA instructor. Don't see a date and/or time that works for you. You are welcome to schedule a different time outside of our already scheduled classes but there is an additional $25 fee. CLICK HERE to complete your registration and get your course key. Please call to schedule your skills session. NOTE: Skills Sessions are performed ONLY at our Gainesville location. PLEASE READ: All students must take the FULL COURSE to receive the 2015 AHA PALS Certification. Course Materials: Students must have access to an ACLS Student Manual (either a traditional book or eBook) before and during class. GatorCPR libraries for FREE books for use before and during class, with the option to purchase the book after the course. If you would like to purchase an eBook Click Here. Questions about eBooks visit: http://ebooks.heart.org/faqs. Each student will receive an PALS Certification Card from the American Heart Association (valid for a full 2-year period). Pediatric Advanced Life Support (PALS) Online Renewal Certification is a three part process. 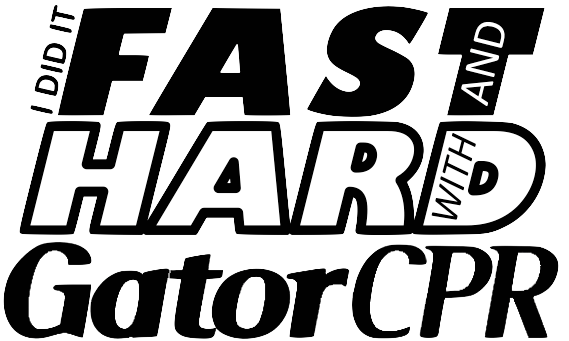 Completion of the full course includes Part 1 online, plus an in-person skills practice and testing session (Parts 2 and 3) with a GatorCPR AHA Instructor. Step 1: Complete your registration. We will be able to schedule your skills session based on your availability. Step 4: Attend your skills practice and skill test. With your online course complete and completion certificate in hand, attend your scheduled course with one of our AHA instructor. GatorCPR offers CPR/AED & First Aid certifications from American Heart Association (AHA) and American Safety & Health Institute (ASHI). PLEASE READ: If you are in the medical field, work or plan to work in a hospital, are in nursing or pharmacy school or an EMT program, this IS NOT the course for you. You will need Basic Life Support (BLS) for Healthcare Provider. If you are unsure of the type of CPR you need please call us at (352) 727-4733. We will be able to assist you. If you need BLS for Healthcare Click Here to register. ​CPR instruction includes high-quality compressions, airway management, breathing, and how to use a mask. $5 DISCOUNT for Students (must have valid ID). Enter STUDENTCPR in the Promo Code box during registration to receive your discount. Course Materials: Students must have access to either a traditional book or eBook before, during & after class. GatorCPR libraries for books for FREE. If you would like to purchase an eBook Click Here. Questions about eBooks visit: http://ebooks.heart.org/faqs. 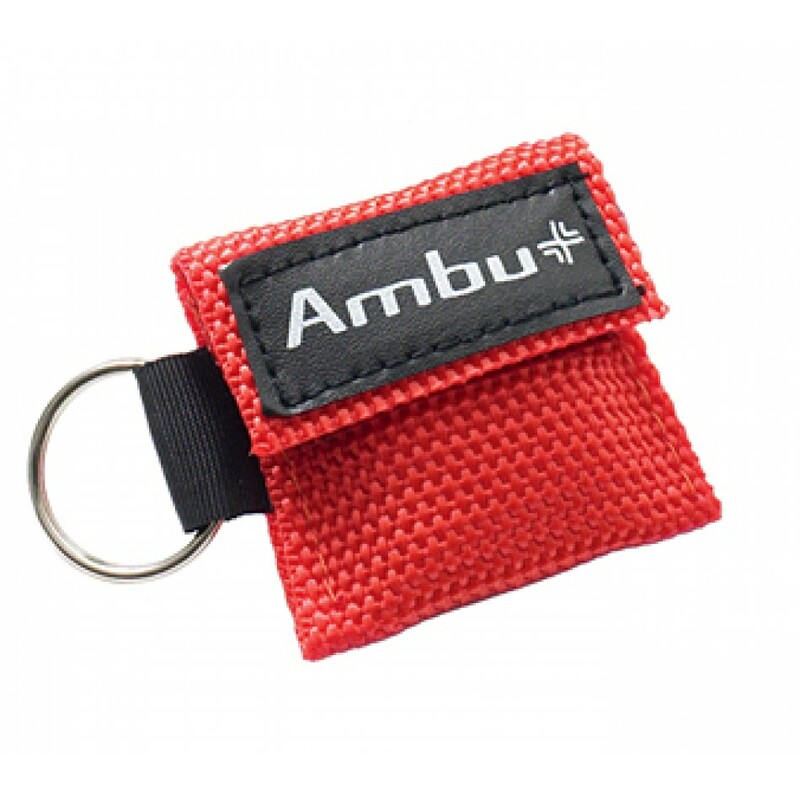 ​First Aid instruction includes bandaging, bleeding, wounds, choking, shock, seizure, fainting, broken bones, sprains, burns, bites, stings, poison, and temperature-related conditions, to name a few. $6 DISCOUNT for Students (must have valid ID). Enter STUDENTCOMBO in the Promo Code box during registration to receive your discount. $4 DISCOUNT for Students (must have valid ID). Enter STUDENTFA in the Promo Code box during registration to receive your discount. PLEASE READ: If you are in the medical field, work or plan to work in a hospital, are in nursing or pharmacy school or an EMT program, this IS NOT the course for you. You will need Basic Life Support (BLS) for Healthcare Provider. If you are unsure of the type of CPR you need please call us at (352) 727-4733. We will be able to assist you. At the end of this class (same day), each student will receive a Certification Card from American Safety & Health Institute OR American Heart Association (AHA certification is optional for $20). Both certifications are valid for a full 2-year period are widely accepted. CPR/AED and First Aid Blended Learning includes an online module with skills demonstration in our classroom with a GatorCPR Instructor. You will see receive an American Safety & Health Institute (ASHI) OR, for an additional $20, you will receive an American Heart Assocation (AHA). The reason for the additional cost for AHA is that the cost for these modules are more expensive. Both certifications are valid for a full 2-year period are widely accepted. For more information about these certifications visit www.GatorCPR.com/ASHI. Don't see a time that works for you. You are welcome to schedule a different time outside of our normally scheduled class but there is an additional $25 to do so. At the end of this class (same day), each student will receive a Certification Card from the American Safety & Health Institute (ASHI), valid for a full 2-year period. AHSI's Pediatric First Aid with CPR/AED Blended Certification includes both an 1.) online video portion and a 2.) classroom portion. This course is consider complete after student completes the online portion AND the in-person skills practice and testing session with a GatorCPR Instructor. This course prepares students to challenge the nursing assistant competency exam in Florida. This fast paced course provides the student an opportunity to review essential materials and practice necessary patient care skills. Students will also complete a practice written examination. Once a student has completed this course they will have the option to apply for and challenge the exam to become a Certified Nursing Assistant. --Once you have passed both parts Florida Board of Nursing will send certificate and add you to CNA registry. To ensure your success, GatorCNA offers a variety of ways to allow you additional practice after you have finished your Prep Course. GatorCNA encourages our students to come back and use the CNA Lab as often as possible to get additional practice. Anytime the lab is available, you are welcome to use the CNA lab. You do not have to register to use the CNA lab.​ CLICK HERE FOR SCHEDULE. Once you register for your Certified Nursing Assistant Prep Course, you are welcome to sit in on additional classes, as a spotter. As a spotter, you will sit in on a class without actively participating. You will be observing other students learning these skills for the first time and may be used as a patient for demonstration purposes. You may ask questions and interact as long as it doesn't take away from the current student's learning experiences. As a spotter you may also help correct current students if you notice they are not performing the skill correctly.​ CLICK HERE TO SCHEDULE. The Med Tech course is designed to educate an individual to assist residents in an Assisted Living Facility and Home Health with self-administration of routine medications, in the State of Florida. This is a fun, interactive course that provides hands-on learning, lecture, discussions, quizzes. Hands-on practice medications with all types of medicinal preparations. Upon completion, students will be aware of the intent of the ruling, the legal definitions. How to properly identify residents, read pharmacy labels, understand the importance of knowing each drug and what it is for, documentation and what is not permitted. Our Medication Technician classes will prepare you for your path to success! Learn the proper utilization of the intent of this law. Learn the safety measures that must always apply when working with medications. Certificate of Completion at end of course (4) hours CEU’s. Course now includes Home Health Assistance: Self Administration. Want to learn more about our CNA Programs. Once a month we host a CNA Information Session, in Ocala and Gainesville, to allow you to learn more about our CNA Prep Course before signing up for this course. If you come to this CNA Informational Session, we will also provide you with a special discount of $30 off your upcoming CNA Prep Course to be used within 30 days of attending this Info Session. 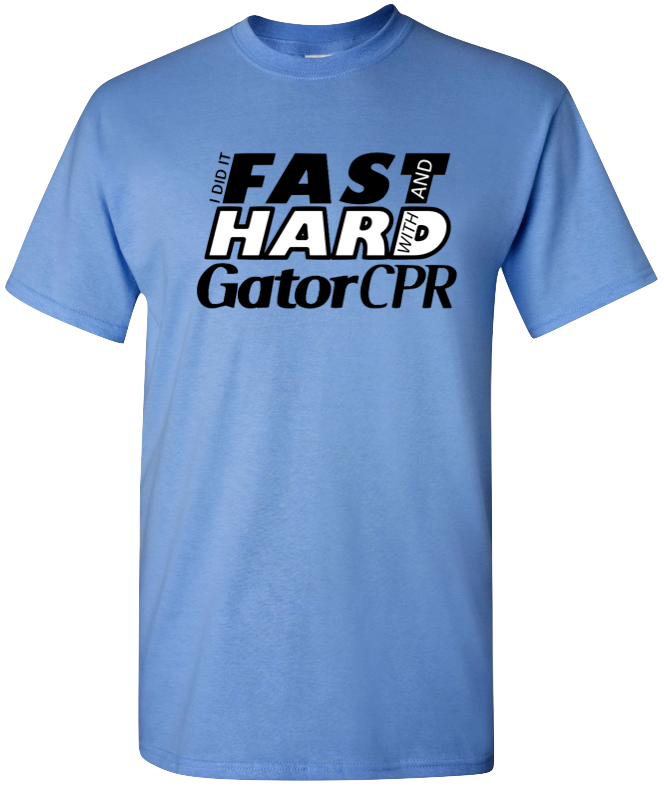 100% of all merchandise sales helps support GatorCPR's non-profit foundation, HeartSafe City Foundation. One of the missions of HeartSafe City Foundation is to fund our AED grant program, whereby AED are placed into the community. Your support in purchasing a t-shirt will help fund our AED grant program. Did you misplace your card or need another copy? The cost to replace your certification card is $15. We will get you your reprint within 24 to 48 hours. To keep classes sizes low, we only allow a limited number of spotters in each class so you will need to register ahead of time to reserve your place as a spotter. Please note that if you MISS your your scheduled CNA spotter session, your opportunity to sit in another CNA Spotter Session may be revoked. You can always contact within 24 hours to cancel. Note that we hold your spot and if you NO SHOW, you prevent another student from sitting in the spot we hold for you. CLICK HERE for map link. Disclaimer: The American Heart Association strongly promotes knowledge and proficiency in BLS, ACLS, and PALS and has developed instructional materials for this purpose. Use of these materials in an educational course does not represent course sponsorship by the American Heart Association. Any fees charged for such a course, except for a portion of fees needed for AHA course materials, do not represent income to the Association.